Before we know it, Calving Season will have started. You know how there’s the meme going around the internet… Be Calm and ______ (fill in the blank with your favorite activity)? The sweatshirt that keeps getting posted on my Facebook page says “I can’t Be Calm… It’s Calving Season!” I really feel like buying that sometimes, though my participation in Calving Season has dropped tremendously! I was the 10:00 girl… every night before I went to bed, I’d dress in multiple layers, grab a big flashlight, stir a dog up to accompany me (and keep the boogers away! 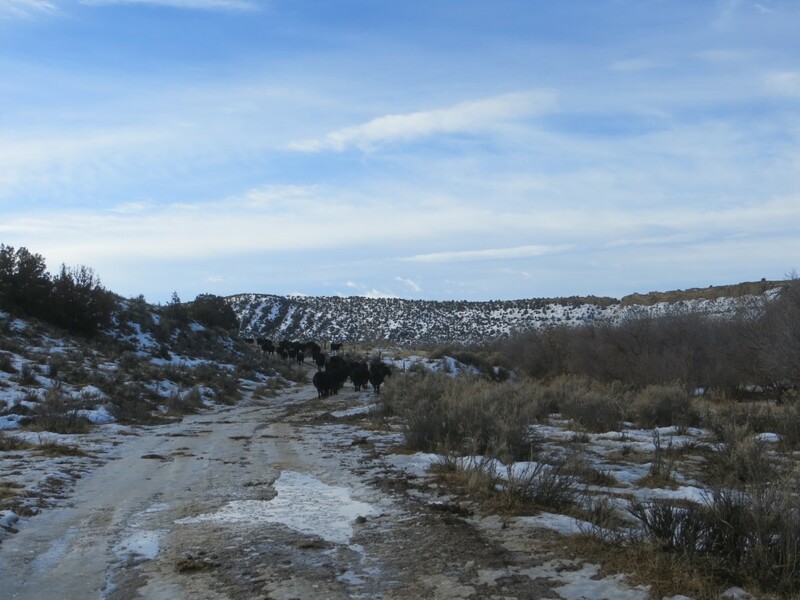 ), marvel at the stars and the Milky Way, crunch through snow, ice, and mud to the calving shed, flip the light on, and walk through the girls to see if anyone was calving. Sometimes I could return home, sometimes I had to bed a stall, cut a heifer out of the bunch (easier said than done), and pen her to calve alone. Well, that’s kind of behind me now… but today, we brought up the heifers to the lot where they’ll spend their days until they calve. I didn’t push them very hard, it rained yesterday on top of our snow… so what didn’t get melted is pretty much ice. We don’t want them to fall on the snow or ice or mud… so, I hung way back behind. I had taken Lucas along, I figured a mile walk would be fun for him and not too much work… but he had to ride the entire time as Tuff showed up as well. He doesn’t like Tuff who is still a stud dog… though Tuff LIKES EVERYONE! We will see if we have any babies tomorrow after this hike! Vernon spent the rest of his afternoon tearing into his snowmobile. It seems that a mouse built a nest in the front of his snowmobile, and not knowing that, he turned on his machine, and it sucked mouse nest and grain all through his engine! He’s having to tear into EVERYTHING, vacuum, and wipe things out. Yeah… it’s horrid. Since it was sooo nice, and no wind, I figured I’d see if my bees were flying. I drove down and wonder of wonders! I still have bees!!!! Oh, that made me happy! I slowly opened the Bee Barn, and went inside. I could see that the bees were just coming from one hive. My little Golden Mean hive didn’t have anyone coming in or out. I cracked the viewing window… and what did I see? A mouse nest. This is the one I’d cleaned last fall from a mouse nest. GRRRRRR. I had laid 1/4″ mesh over the entrance, hoping that would be enough to discourage mice, but I didn’t fasten it good enough. They had reoccupied and rebuilt and ate more honey. The bees were all dead and gone. I brought it home, and by golly, I don’t think this will happen again! Needless to say, if you’re a mouse… you might not want to show your wiggly little nose around this place anytime soon! “I hate meeses to pieces…” too. And I don’t have bees or expensive farm equipment! But, my new ES – Sandy – almost caught a mouse the other night.